Articles How much live rock do I need? Do you even need live rock at all? How much live rock do I need? That’s one of the most common questions when setting up a new saltwater aquarium. You might be surprised to find out you really only need 10-20 pounds of live rock, no matter how big of an aquarium you have. I will explain why in a moment. The question: “what is live rock” is another common question–quite frankly–because the term seems to make no sense. When we set up a reef aquarium, we are not just keeping fishes or corals, we are actually creating a tiny ecosystem in our tanks. Live rock is a term used to describe one of the basic building blocks of that ecosystem. To someone only recently exposed to the hobby, the term can sometimes be confusing and the price tag can be confounding. I remember learning in school a very long time ago that rocks are not alive. Please note that reef aquarists are not able to will rocks to life, like Dr. Frankenstein. While live rock is not alive, per se, it is the home to millions upon millions of bacteria, as well as other tiny invertebrates which are beneficial. Technically, you don’t need live rock, but you probably want to have live rock in your tank. If the live rock doesn’t give you the look you’re going for, you could absolutely decorate your aquarium with something else. Since live rock serves as the home for a lot of your bacterial filter and the invertebrates in your aquarium, you may need to add a filtration medium to your sump to create enough surface area for the bacteria to grow. The old rule of thumb, when I started out in the hobby, was to add 1-2 pounds of live rock for every gallon of aquarium volume. For example, if you had a 55-gallon aquarium, the standard advice was to add 55 to 110 pounds of live rock. If you had a 90-gallon aquarium, you were supposed to add 90 to 180 pounds of live rock. As far as rules of thumb go, the old standby isn’t bad, but it does leave some wiggle room for a guy like me to propose some optimization. The challenge with any rule of thumb like this is that there are a lot of variables that come into play. 100 pounds of a dense, heavier rock takes up a lot less space than a 100 pounds of a less dense rock. Plus, you have to allow for room to design the right aquascape. If you are building a new tank from scratch, I actually recommend you start out with 10-20 pounds of live rock, regardless of the volume of your aquarium. Why so little? Well, the nuance here is that I’m proposing you set up your tank mostly with dry rock instead. Dry rock is live rock’s less interesting and less expensive cousin. Filling your tank with one pound of live rock for every gallon will likely cost you hundreds of dollars. You can fill your tank with the dry rock for a fraction of the price if you are able to shop around. If you have the time, I recommend you start out slowly. You don’t have to get the rock all at once. 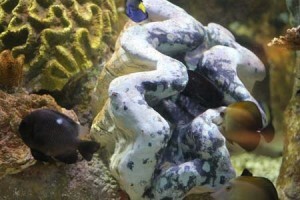 See what your aquarium looks like with a half-pound of dry rock per gallon. See how you like the look of the tank. Is it too sparse? Is there enough room for all of the corals you envision? If not, scale up by adding more rock in ¼ to ½-pound increments. Once you have the look you desire, then add 10-20 pounds of live rock. 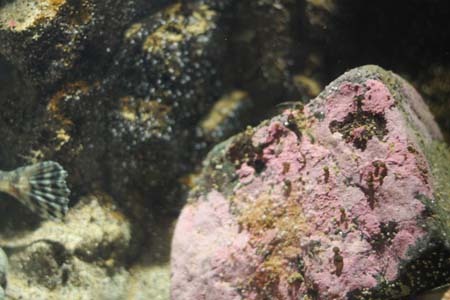 Over time, the coralline algae, bacteria, and invertebrates from the live rock will spread out and colonize the dry rock. How much live rock do I need? The amount of live rock you buy for your saltwater aquarium is really a decision about what you want your aquarium to look like and how much money you want to spend. In the end, you still may want to have approximately a pound per gallon, but since all rock becomes live rock, over time, you may want to start out with 10-20 pounds of live rock, regardless of the size of your tank and save some money (and a reef) by adding the rest as dry rock. Spend the money you save on something alive that is a little bit more interesting and not buried under the other rocks in your tank. Get saltwater aquarium news, videos and tips sent to your inbox, as well as a free resource for signing up. Why are you not talking about curing the live rock? Hi Mary, thanks for the comment. I added a link to some more information and will add that to the list of things to write about in the future. Thank you!